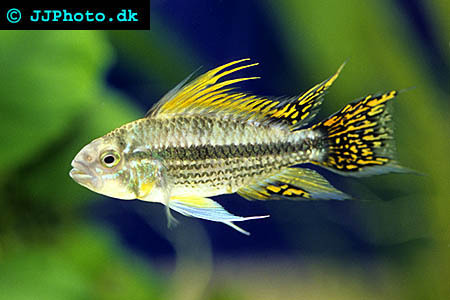 Company: Apistogramma cacatuoides (Cockatoo Dwarf Cichlid) should only be kept with other small peacefull fishes. 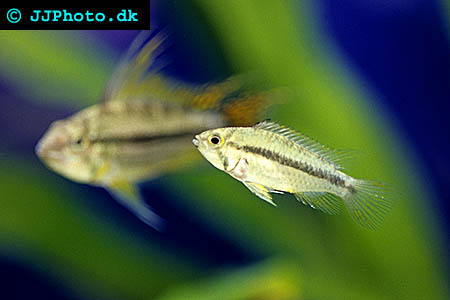 Aquarium setup: Apistogramma cacatuoides (Cockatoo Dwarf Cichlid) Is best kept in a densly planted aquarium with open areas. The aquarium should offer a lot of caves and hiding places among roots and rocks. Keep one male with 3-4 females. Feeding: Apistogramma cacatuoides (Cockatoo Dwarf Cichlid) accepts flake food but should not be kept on flake food alone. Best feed live and frozen food. 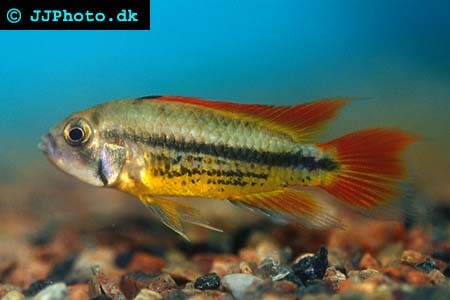 Breeding: Apistogramma cacatuoides (Cockatoo Dwarf Cichlid) spawns in a cave or on a root. Each spawning only results in a smaller number of eggs. Usually only around 50.